I loved Carl’s beautifully written post on "What counts is description," especially his comments on separation and highlights/shadows. 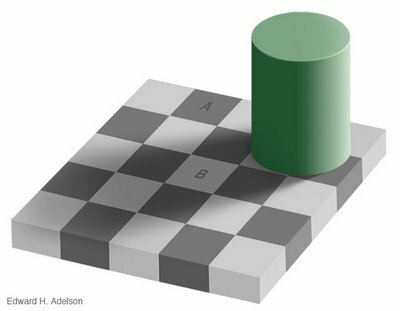 The little demonstration below really drives home for me just how much our perception of brightness is only vaguely based on brightness. Take a close look at the image. There’s one square labeled "A," and one square labeled "B." Make up your mind about which is brighter, and which is darker. Then save the image to your disk, load it up into photoshop, and measure the color in the two squares. This lesson is directly applicable to printing. Often it’s if your goal is to make something look brighter (or darker), it’s better to alter the context than it is to adjust the absolute brightness of that spot in the print. Featured Comment by Mike Rebholz: If you're on a Mac there is no need to open the image in photoshop. Go to utilities, open digital colormeter, roll over the squares, and observe the read-out. Mike adds: Just so you don't actually have to measure unless you want to, as you can guess the values of square A and square B are exactly the same. I'm using Firefox with ColorZilla extension installed. That's a quick way to check color too. Great post, thanks. Love the site. This is a rather timely series of topics for me, as I've spent the past few days catching up with scanning and printing some film images. Grab some aspirin and have fun! Uwe's article is awesome. Go take a look! Ooh, I didn't even know about the DigitalColor Meter. Great tool and toy.